If you’re a Fishing Club member and you catch a trout with a tag near its dorsal fin, you win a $50 clubhouse gift certificate for dining at the Clubhouse! If you’re not a Fishing Club member and catch a tagged trout, you win a $25 clubhouse dining certificate and a 1 year free Club membership, if eligible. One award per color per membership year is allowed. The tag must be turned in to Ray Tuers, 877-5572. On Sunday 7/29 Bruce Redler, of Oakanoah Court, caught a 2-pound, 4-ounce tagged trout. Bruce was fishing from the Lake Ticoa dam around 3 p.m., using Power Bait on the bottom. The fish carried a green tag and was from 2017’s stocking; this year’s tag color is blue. Dan Hartley, of Oakanoah Court, caught an 18 ½ inch trout June 23 off the shore near the dam at Lake Ticoa. The fish was from 2017’s stocking and carried a green tag; this year’s tag color is blue. Dan caught it using chicken skin and garlic. As a non-club member, he gets a $25 clubhouse dining certificate, plus free Fishing Club membership for one year. On 6/8/2018 Steve Pyle, of Ayugidv Ct. landed a blue-tagged rainbow in Lake Wanteska. As a club member, Steve gets a $50 gift certificate for our Overlook restaurants. Congratulations Steve! The second tagged fish of 2018 was caught by Tom Reinke, of Utsonati Lane. Tom landed a blue-tagged 13-inch, 1-pound rainbow April 2nd in Lake Atagahi on a Joe’s Flies lure. Mark Baldwin, of Usdasdi Drive, caught the first tagged fish of 2018 on March 24. It was one of the five blue-tagged trout put in Lake Tiaroga two weeks earlier. Mark caught the 14-incher while fishing at the dam using an Acme Kastmaster lure. In early November 2017, Marshall Evans caught a very nice tagged trout, 21” and 3 ½ lbs, in Lake Atagahi. That is the 10th reported tagged trout for 2017. Marshall will receive a $50 gift certificate for Clubhouse dining. Congratulations to Lee Allaben of Chagee Lane. Lee caught a green-tagged 19” rainbow in Lake Ticoa on August 26th using a plastic worm. As a club member, Lee gets a $50 gift certificate for our Overlook restaurants. Congratulations to another winner in the Fishing Club’s Trout Contest for holders of CF fishing licenses. 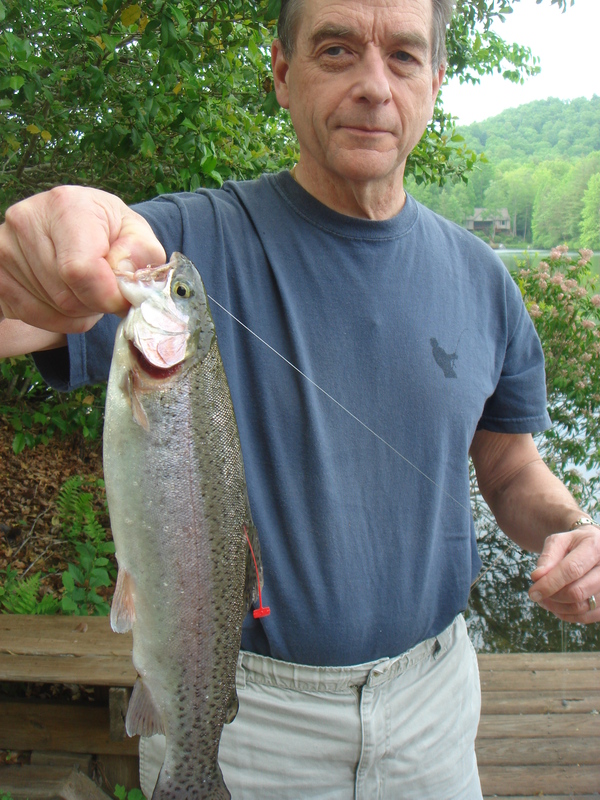 Steve Pyle, of Ayugidv Ct., caught a tagged 14” rainbow on June 4th using Power Bait in Lake Wanteska. As a club member, Steve gets a $50 gift certificate for our Overlook restaurants. Chris Brown of Konnaneeta Ct. caught a green-tagged rainbow using power bait April 10 on Lake Atagahi. As a club member, Chris gets a $50 gift certificate for our Overlook restaurants. Roy Pease, of Kanvsita Ct., caught a green-tagged 14” rainbow using Power Bait April 11 from the shore at Atagahi Park. As a club member, Roy gets a $50 gift certificate for our Overlook restaurants. Fishing Club veteran Bill Roehrich, of Kanunu Ct., landed a 16” rainbow with a green tag April 10 while fishing for bass in Lake Atagahi. Bill was casting around a small stream inlet at the extreme south end of the lake, casting a Rage tail craw imitation. Rob Amato landed an 18”, 2 ¾ lb. rainbow with a yellow tag on April 4th while fishing Lake Tiaroga on 2 lb. test line using a crankbait lure. This is Rob’s 2nd tagged catch this year! The yellow tag is from the 2016 stocking. Rob’s catch last month was a green tagged trout from the 2017 stocking. Congratulations to Chris Wunder, our third tagged fish winner this year! On March 25th, Chris caught an 18″, 2 lb rainbow trout on lake Ticoa with a green tag near its dorsal fin. Chris was fishing with an ultralite spinning rod and using a brown & green jig. Ray Tuers reported that “for the first time in the nine years I have been running the Trout Contest, I CAUGHT A TAGGED FISH!!!”. Ray’s catch was a 5-inch rainbow, green tag, using a rooster tail, off Atagahi Dam at 1:30 p.m.
Robert Amato caught a nice 17″ 2.5 lb rainbow on March 20th that had a green tag near its dorsal fin. Robert used a crank bait that resembled a fingerling rainbow, and reportedly the trout jumped a dozen times out of the water. Steven Pyle, of Ayugidv Ct, caught a 17″ tagged trout using Powerbait on Lake Wanteska July 9th. Bill Buchler, of Tlvdatsi Drive, caught a 16″ yellow tagged trout in Lake Atagahi using Power Bait on June 24th. Mike Rothman, of Middle Connestee Trail, caught a 16″ tagged trout on June 1st. Ron Phillips, of Tsayoga Ct., was fishing in Lake Ticoa April 9 when he caught a 15-inch rainbow with a yellow tag. He was using a Rapala deep-dive lure. On March 16, Scott Fluck, of Soquili Dr., landed a yellow-tagged 16-inch rainbow using Power Bait in Lake Ticoa. Less than a week earlier, on March 10, Mike Sterinsky, of Connestee Trail, became the first winner in 2016, catching a 15-inch rainbow with a yellow tag, the new color for this year. He was fishing with four-pound-test line, using a silver spinner, in Lake Atagahi. That was the first fish reported in the contest since Bill Hudson’s win in October. On August 24, 2015, Dennis Shardell, of Kanasgowa Drive, caught a nice 14″ red tagged trout while fishing with power bait in Lake Atagahi. On August 6, 2015, Scott Fluck caught a red tagged trout and collected his $50 clubhouse certificate. In early June 2015, Steve Pyle, of Ayugidv Court, landed this pretty rainbow trout early in June, 2015 while fishing from his dock on Lake Wanteska. That red tag near its dorsal fin got Steve a win in the Club’s trout contest.